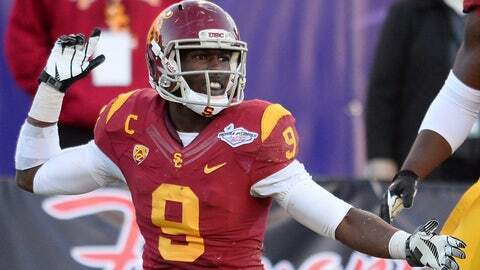 USC wide receiver Marqise Lee is one of many player yet to make a decision on returning to school. LAS VEGAS — There are decisions to be made for USC draft eligible players and at the conclusion of their 45-20 win over No. 20 Fresno State in the Las Vegas Bowl on Saturday night, none of that has changed. Marqise Lee took it all in following Saturday’s win over Fresno State. He ran down the sideline shaking hands with fans. He posed for pictures on the field. He signed autographs. If Saturday was his last game in a USC uniform, he didn’t leave a stone unturned. Lee flashed back to show the nation what he looked like in 2012 when he won the Biletnikoff Award. He finished the game with seven catches for a season-high 118 yards. Lee had just two touchdowns on the season coming into the game. He had two on Saturday. However, what seemed inevitable –that at the end of last season that he would become USC’s all-time leader in receptions –didn’t come to fruition. Lee finishes the season and potentially his career five receptions short of the record owned by former teammate Robert Woods. Lee has said he hasn’t discussed turning pro with his family yet and intends to do so following the bowl win. There was some discussion that defensive back Josh Shaw would definitely be returning for his senior season but he dispelled that myth. "It’s not official (that I’ll return)," Shaw said. The fourth-year junior says he has not received his NFL evaluation yet and will hold off before making a decision. Safety Dion Bailey, also a fourth-year junior, says he will wait to discuss the issue with his family before making a decision. After spending his first two seasons on the field at linebacker, Bailey moved back to his natural safety position this season. He and Shaw have benefited from first year defensive coordinator Clancy Pendergast. Bailey finished 2013 with a team-high five interceptions. Shaw provided to be a pivotal part of the defense because of his versatility. Shaw, who began his career at Florida and in four seasons at the college level has had four different defensive coordinators, holds Pendergast in the highest regard. "Coach Pendergast is definitely second-to-none, " Shaw said. "I think he’s the best signal caller out there." 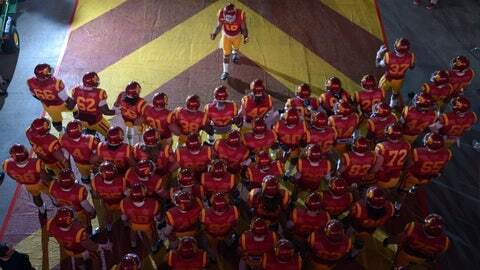 On Saturday, the USC defense held the nation’s third ranked offense to just 254 yards.